The poet discerns a chasm separating a ‘them’ and an ‘us’, certain ones and our ones identified in Squarings xlii as the Irish nearly blessed … gaunt ones. The other side of death will be kinder to certain ones … what was written may come true; their souls will be relocated , separate from the ‘us’ (in the distance), in an arcadian land of milk and honey (the mouths of rivers). No such blessing for the poet’s ilk (our ones, no), returned post mortem to the arid best they knew: Dryness that was heaven on earth to them and starvation (scones baked out of clay). For the blessed, a feast for the senses: sights (delta’s reed-beds), touch (cold), light (bright-footed), sound and movement (seabirds always wheeling). For the ‘us’, the charred remnants of poverty (snuff … hob-soot … ashes) and the presence of the dominant figure (judge) who has held them back (comes between them and the sun), ostensibly holding things together (pillar) and beaming (radiant) but to Heaney’s mind totally without substance (house-dust). The implication that Heaney is referring to the Catholic Church seems to have no other explanation but the poet stops short of accusation. MP 221 Perhaps the only afterlife is the one created by the Imagination, (Heaney) suspects, yet, paradoxically, the more space Heaney puts between himself and orthodox belief, the less embarrassed he is speaking of souls and spirits. As many reviewers have pointed out, there is a growing conviction that “there is no next-time round” (I), that “All gone into a world of light?” means “All gone” (Squarings xliv); any consolation ‘perhaps’ and ‘may’ in xliv and xlv might have possessed comes up against the definite Images of transience with which those poems end, the dead leaf swirling, ashes and house-dust. 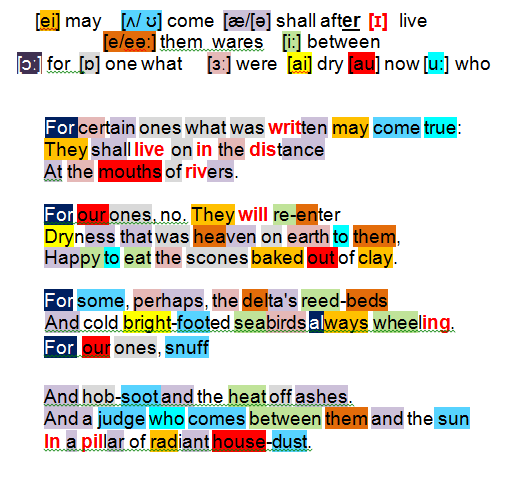 NC 179 For certain ones what was written may come true … Squarings xlv proceeds in the way of many poems in the sequence: a speculative proposition gives rise to ruminative meditation which then modulates into the self-corrective production of an enduring image, emblem or figure. Here, the afterlife is ren­dered with absolute local specificity: the dead once more, as in Squarings xlii, are anchored in the ground of their previous dwelling.